Store in a cool & dry place, please refrigerate after opening. Ingredients: Snow Cabbage (56%), Bamboo Shoos (24%), Soybean Oil (GMO), Chilli Paste (Chilli, Salt), Salt, Water. 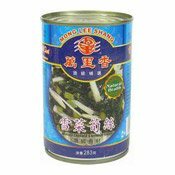 Simply enter your details below and we will send you an e-mail when “Braised Cabbage & Bamboo Shoots (萬里香雪菜筍絲)” is back in stock!